Aim: An attempt is made to investigate clinical efficacy of cord, paste system, and a strip gingival retractile materials. This study aims to evaluate and compare the gingival retraction efficacy of retraction strip along with conventional retraction cord and paste system. Material and Methods: This in vivo experimental study was carried out on 30 patients. Three different gingival retraction systems were used to evaluate the amount of vertical and lateral displacement. Based on selection criteria, 30 individuals requiring fixed dental prosthesis with respect to mandibular first molar were selected. Tooth preparation for metal ceramic restoration with subgingival finish line was performed. Gingival displacement was accomplished with ultrapak cord, merocel strip, and magic foam cord immediately, 7 and 14 days after the tooth preparation, respectively. The amount of gingival displacement in vertical and lateral directions was measured at mesiobuccal, midbuccal, and distobuccal regions of the prepared tooth. The vertical retraction was measured intraorally by using digital vernier caliper, and postgingival displacement impression was used to measure lateral gingival retraction. Stereomicroscopic images of impression under ×10 resolution were transferred to image analyzer to measure the lateral displacement. The obtained data analyzed in one-way ANOVA and Bonferroni test were used to determine the significant difference at P < 0.05 level. Results: ANOVA test showed the significant difference between the materials tested with respect to the mean vertical and lateral gingival retraction (P = 0.001). Multiple comparisons by Bonferroni test revealed a significant difference in vertical and lateral displacement among the materials tested. Conclusions: Merocel strip provided the maximum amount of vertical and lateral tissue displacement, followed by ultrapak cord and least with magic foam cord which was statistically significant. In fixed prosthodontic treatment, deflection of gingival tissues before making an impression is one of the important phases. The glossary of prosthodontic terms ninth edition defines gingival displacement as “displacement of the marginal gingiva away from a tooth.” In 1986, Benson  described the significance of lateral and vertical gingival retraction. Lateral retraction displaces the tissues so that an adequate bulk of impression material can be interfaced with the prepared tooth. Vertical retraction exposes the uncut portion of the tooth apical to the finish line. As described by Ferrari et al. in 1996, the effective management of gingiva before impression making is necessary so that the restoration has a suitable emergence profile with well-adapted and smooth gingival margins which in turn helps maintain the healthy periodontium. Gingival deflection techniques are classified as mechanical, chemicomechanical, electrosurgical and rotary curettage, or a combination of these techniques. The diversity of clinical situations has led to combine different techniques and evolution of different products, and a variety of contemporary materials are available these days. Chemicomechanical method using the cord with a hemostatic agent is a commonly used technique to provide space between the gingiva and the prepared tooth. The cordless technique includes expasyl, magic foam cord, gingitrac, race gel, traxodent, and merocel strips. Several research works have been carried out to determine their clinical performance. In 1996, Marco Ferrari et al. introduced merocel polymer strip as a gingival retractile material. Till date, investigations to compare the clinical efficacy of merocel strip along with the commonly used cord and paste systems have not yet reported. Hence, this in vivo research work was designed to study the comparative effectiveness of vertical and lateral gingival displacement produced by merocel strip, magic foam cord, and ultrapak retraction cord. This research work also studied the time taken for placement, hemorrhage control, and relative ease of handling. The null hypothesis to be tested was there will not be any difference in the amount of lateral and vertical gingival tissue displacement produced by all the three systems investigated. Thirty patients requiring fixed dental prosthesis with respect to mandibular first molar, vital or nonvital, were selected in this investigation. For the scope of this study, convenient sampling was deployed; volunteer patients were considered as individuals for the research. Medically compromised patients, pregnant and lactating women, and those who have undergone any type of periodontal surgery in the past 6 months were not included in the study. The research protocol was evaluated by the institutional ethical committee and clearance was received. Informed consent was obtained from the participants. A variable thickness of the impression materials in stock tray may result in dimensional changes and inaccuracies in the cast obtained. It has generally been concluded that a custom tray is advisable for procedures requiring utmost accuracy of the working model. This fact has been the primary rationale for the use of custom trays which also provide improved patient comfort, reduced waste of expensive impression material, and overall cost-effectiveness. In 2007, Wu and Donovan  introduced a technique of fabricating custom tray using vacuum-formed resin sheets as a spacer for putty wash impression technique. The same technique was used in this present study to ensure accurate tissue details of postgingival displacement impression. Preliminary casts were used to fabricate custom-made trays. The custom tray was fabricated by applying a spacer [Figure 1] of 4 mm vacuum-formed sheet (Soft tray sheets, Ultradent). These sheets were used to have a uniform thickness of impression material. Tissue stops were incorporated in the spacer. For each patient, three perforated sectional custom trays [Figure 2] were fabricated to make the postdisplacement gingival impression. A total of 90 trays were fabricated using auto polymerizing acrylic resin material (Rapid Repair Cold Cure, Pyrax, India). To ensure more accurate tissue details, postdisplacement gingival impression was made with the highly viscous putty consistency of addition silicone material relined with light body syringe material (Ivoclar, Vivadent, India). The putty consistency provides better displacement of gingival tissue, and the stiffness of this highly viscous material helps to force the light body material into close contact with the prepared teeth and surrounding tissues to ensure a more accurate impression of the details of the preparation. A handle was made for easy insertion and retrieval of the impression. These trays were made at least 24 h before impression making to minimize distortion. Trays were perforated using round tungsten carbide bur. 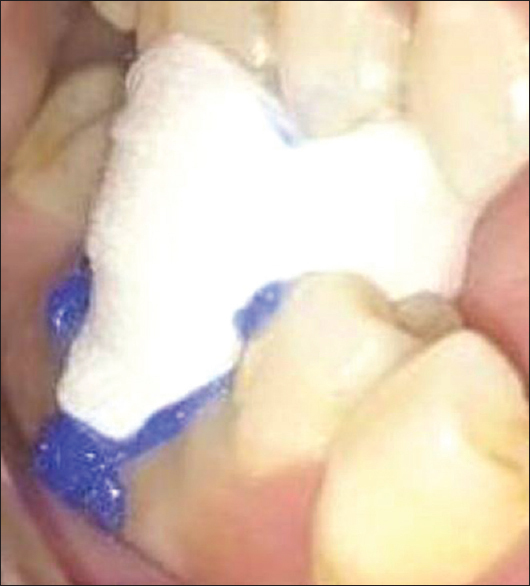 The standard clinical protocol was followed for tooth preparation to receive a porcelain-fused-to-metal crown and the subgingival finish line was prepared. Gingival displacement was achieved before making the impression. Before applying each retractile material, gingival index was ensured to be zero using Löe gingival index (GI). Displacement and measurement of gingival sulcus were performed at three different time schedules under three phases. Ultrapak retraction cord (Ultrapak, Ultradent products, USA) of adequate dimension was selected (sizes #000, 0, 1, and 2) on the basis of gingival tissue biotype. The cord of adequate length was cut and impregnated with 10% aluminum chloride hemostatic solution (Roeko, ColteneWhaledent) for 5 min. The cord was then looped around the tooth and packing was started from the mesial interproximal region by gently pushing the cord into the sulcus. The cord packer (Hu-Friedy, USA) was angled toward the tooth surface so that the cord was pushed directly into the sulcus [Figure 4]. It was ensured during the placement and removal of the cord that no laceration and bleeding from surrounding tissue occurred. Cord placement was continued all around the tooth. The ease of placement was assessed subjectively by the operator. The time taken for placement of cord was recorded using a stopwatch. The cord was left in the sulcus for 8 min, after which it was slowly removed and gingival sulcus washed and dried. Immediately, following the removal of cord, amount of vertical gingival retraction was measured at the three regions of the tooth, mesiobuccal, midbuccal, and distobuccal using digital vernier caliper [Figure 5] (Swan Machine Tools Pvt. Ltd, India). Then, spacer was removed from the custom tray, the adhesive was applied, and an impression was made using a single-step impression technique with the help of putty and light body material (Ivoclar, Vivadent, India). The tooth was temporized (Protemp, 3M, ESPE, USA) using temporary luting cement (3M ESPE, USA). To measure the lateral displacement, stereomicroscopic (Lawrence and Mayo, USA) images (×10 resolution) of the impression were used. The amount of lateral gingival retraction at mesiobuccal, midbuccal, and distobuccal regions of the sulcular extensions was measured [Figure 6]. The measurements were compared using image analysis software (Pro-Express; Media Cybernetics, Silver Spring). After 1 week of duration, individuals were reviewed for gingival health and gingival index 0 was confirmed. Provisional crown was removed and retraction was performed using merocel strip (Mystic, conn USA). 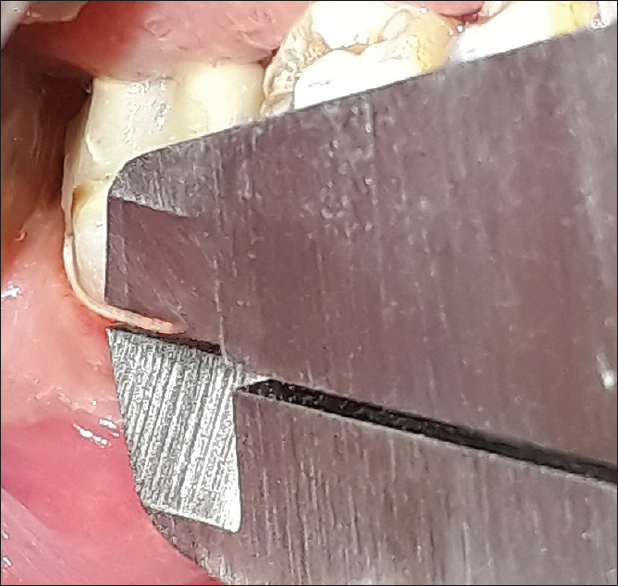 2 mm thick merocel retraction strip was inserted around the tooth using cord packer [Figure 7] and the provisional crown was positioned on the prepared tooth and a cotton roll was placed on the crown and the patient was instructed to bite to maintain the pressure for 10 min. After 10 min, material in the intracrevicular space was removed and the tooth was washed and dried. Measurement of vertical and lateral displacement was performed as described under the Phase I. The time taken for the application of strip was measured. Individuals were recalled after 2 weeks, and the gingival index was confirmed to be 0 with respect to the required tooth. The retraction was performed using magic foam cord (Coltene, Whaledent, Switzerland). It consists of two cartridges of the base (white) and catalyst (blue) pastes of expanding type of polyvinyl siloxane retraction material, automixing gun, mixing tips, intraoral tips, and Anatomic Comprecap. The Comprecap is available in three different sizes of incisors, premolars and for molars. In this study molar Comprecap was used. An optimum mixture of paste was ensured by dispensing the material onto a cotton roll until the base and catalyst expelled in equal amounts. The intraoral tip was placed into the sulcus, and the material was injected. The selected Anatomic Comprecap was placed, and the paste was pushed into the sulcus. The patient was instructed to bite on the Comprecap [Figure 8]. After 5 min, the Comprecap with the set paste attached to it was removed. The tooth was washed and air dried to measure the vertical and lateral tissue displacement as performed under the Phase I. Time taken for the procedure was recorded. Data obtained were tabulated and analyzed by ANOVA test (P = 0.001), and Bonferroni test was used to compare the difference between three systems. P < 0.005 indicated statistically significant difference. The present study was conducted with the purpose of analyzing the clinical efficacy of three commercially available gingival retraction systems, i.e., ultrapak retraction cord, merocel retraction strip, and magic foam cord paste. The amount of mean and standard deviation values of vertical tissue displacement obtained is 1.24 mm and 0.19, 1.66 and 0.37 mm, and 0.60 and 0.19 mm for ultrapak cord, merocel strip, and magic foam cord, respectively. According to ANOVA test [Table 1], statistically significant difference was noted between the groups with respect to the mean vertical gingival retraction (P = 0.001). The multiple comparisons [Table 2] using Bonferroni's test showed a significant difference between ultrapak cord and merocel strip with respect to the mean vertical gingival retraction (P = 0.001) and also between merocel strip and magic foam cord (P = 0.001), and significant difference was found between ultrapak cord and magic foam cord with respect to the mean vertical gingival retraction (P = 0.001). The amount of mean and standard deviation values of lateral tissue displacement obtained is 0.85 mm and 0.45, 1.12 and 0.69 mm, and 0.36 and 0.13 mm for ultrapak cord, merocel strip, and magic foam cord, respectively. According to ANOVA test [Table 3], statistically significant difference was noted between the groups with respect to the mean lateral gingival retraction (P = 0.001). The multiple comparisons [Table 4] using Bonferroni's test revealed a significant difference between magic foam cord and merocel strip with respect to the mean lateral gingival retraction (P = 0.001) and also between the ultrapak cord and magic foam cord (P = 0.001). However, no significant difference was found between the ultrapak cord and merocel strip with respect to the mean lateral gingival retraction (P = 0.05). This in vivo study included thirty individuals requiring the crown with respect to mandibular first molar, vital or nonvital. Clinical investigation was performed for comparative evaluation of the efficacies of merocel strip, ultrapak cord, and magic foam cord systems in displacing the gingival tissues. The research work analyzed the effectiveness of these gingival retraction systems on vertical and lateral gingival displacement. The individuals in the study were assessed clinically and radiographically for the sound condition of the teeth. Individuals with thick gingival biotype were chosen in this study. Thick gingival biotype depicts broad zone of keratinized tissue. Thin gingival biotype represents a thin band of keratinized tissue which is more sensitive to trauma resulting in deepening of sulcus and gross recession due to exaggerated response of tissues. The teeth were prepared for full coverage restoration with subgingival margins taking care to avoid damage to surrounding gingival tissues. For each patient, all the three gingival retraction systems were used following the manufacturer instructions with an interval of 1 week. To minimize interoperator variability, tooth preparation, retraction procedure, and measurements of tissue displacement were accomplished by a single operator under the supervision of a senior prosthodontist. Displacement cord technique is the most commonly used method. Nonimpregnated and impregnated cords are available. Weir and Williams  demonstrated that nonimpregnated cords were less suitable for a hemostatic purpose than those impregnated with aluminum sulfate and epinephrine. Runyan et al. reported that soaking the cord in an aluminum chloride solution before placing it in the gingival sulcus provides hemostasis but does not lessen the cord's ability to absorb crevicular fluid. Hence, in this present study, 10% aluminum chloride hemostatic agent was used. de Camargo et al. in 1993 observed that hemostatic solutions absorbed by retraction cords did not alter the polymerization and accuracy of impression materials. O'Mahony et al. recommended careful removal of all traces of medicaments before making the impression with vinyl polysiloxane. This suggestion was thoroughly implemented in our study. With each retraction system tested, tooth preparation was thoroughly rinsed and dried, and an impression was made. Ultrapak cord soaked in 10% aluminum chloride was used in this study. Ultrapak cord is a knitted type of material consisting of miniature loops of 100% cotton, forming a long, interlocking chain. This unique knitted design mechanically displaces the gingival tissue, absorbs crevicular fluids, and exerts a gentle, continuous outward force as the knitted loops seek to open, while aluminum chloride results in vasoconstriction that causes gingival shrinkage. Optimal tissue displacement occurs in 3–8 min. Aluminum chloride is one of the most widely used chemicals to impregnate the retraction cord. This astringent acts by precipitating the protein, constricting the blood vessels, and by extracting the fluid from tissues. This is usually used in the concentration of 5%–25%. It has minimal tissue damage. 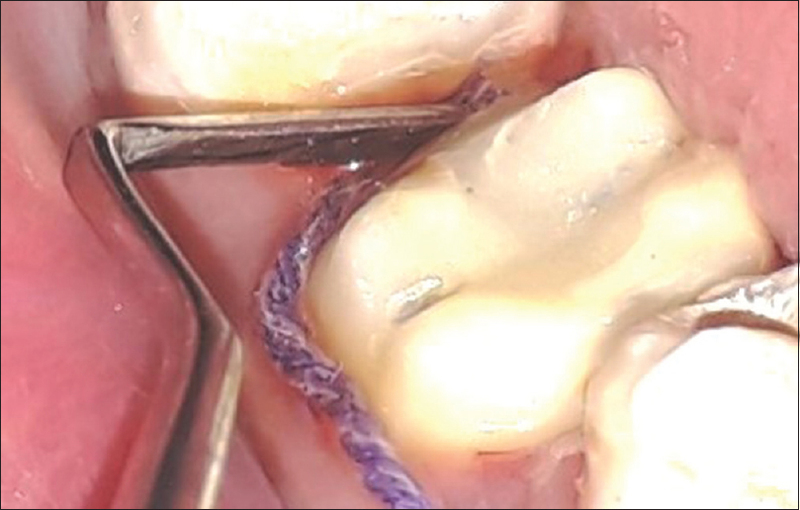 In this present study, ultrapak cord system was used immediately after the preparation. Two cordless systems were considered in this present study, merocel strip and magic foam cord. Ferrari et al. 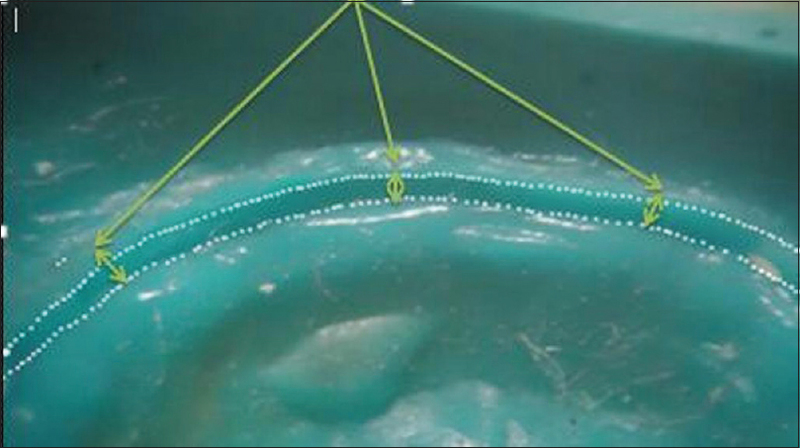 in their preliminary clinical study investigated that merocel retraction strips performed suitably, especially with a vulnerable width of adherent gingival tissue. The clinical performance of this material has not been compared with retraction cord and paste systems; therefore, merocel strip was chosen in this study. Merocel strip and magic foam cord were investigated 7 and 14 days of interval following the preparation, respectively. The same sequence was followed for all the thirty individuals so that all three retraction systems were compared with each other. The parameters used in this study to compare the three retraction systems were the amount of vertical and lateral gingival retraction. Vertical tissue displacement was measured intraorally by using digital vernier caliper having an accuracy of 0.01 mm, and lateral retraction was measured indirectly using the stereomicroscopic images of the postdisplacement impression of the prepared tooth. For impression procedure, custom-made impression tray was used. Autopolymerizing custom tray with a spacer of 4 mm thick vacuum-formed resin sheet was fabricated and single-step putty light body wash impression was made for accurate details of tissue. Literature review unveiled the availability of several instruments and apparatus to measure the depth and width of gingival sulcus such as modified boley's guage, low power microscope to measure on the cast of prepared abutment, specifically designed dental endoscopic images, ultrasonographic periodontal probe, centrally rotating periodontal probe and remote-recording periodontal depth probe, manual periodontal probe, flexible strip, stereomicroscopic images of the impression  and digital vernier caliper. In this study, digital vernier caliper was used to measure vertical gingival retraction and stereomicroscope to measure lateral gingival retraction on the impression using image analysis computer software. After the application of retraction system, with the help of digital vernier caliper, the vertical retraction at mesiobuccal, midbuccal, and distobuccal regions was measured on the prepared teeth. These locations on the buccal aspect were chosen for the sake of convenience in recording the measurements. This recording gave the sulcus depth after gingival retraction. Similarly, the measurements were recorded for all 30 individuals and compared to obtain net amount of vertical gingival retraction. 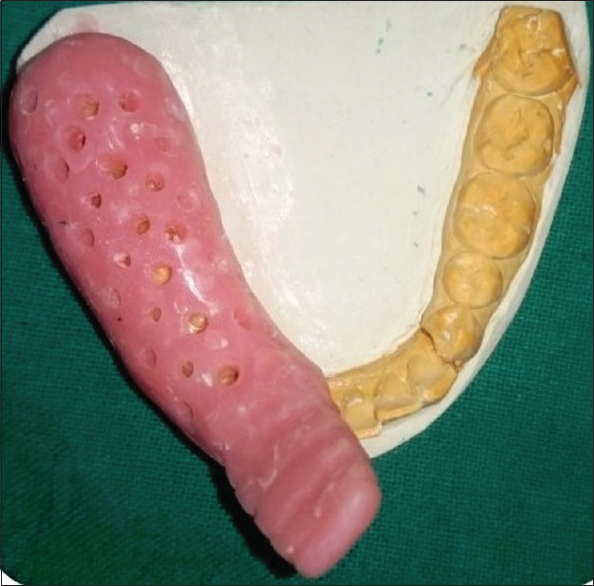 To record the lateral retraction, addition silicone impression of prepared tooth was made. The stereomicroscopic images (×10 resolution) of individually prepared tooth on the addition silicone impressions made after retraction were compared using image analysis software. The width of gingival sulcus was measured at mesiobuccal, midbuccal, and distobuccal regions of the sulcular extensions. The image analysis measurements were in millimeter grading. The amount of mean and standard deviation values of vertical gingival retraction attained using ultrapak cord was 1.24 mm and 0.19, for merocel strip, 1.66 mm and 0.37, and for magic foam cord, the values are 0.60 mm and 0.19, respectively. These values vary from the minimum of 0.84 to maximum of 1.74 for ultrapak, minimum of 1.09 to a maximum of 2.62 for the merocel strip, and for magic foam cord, minimum and maximum values were 0.27–1.21, respectively. The amount of mean and standard deviation values of lateral gingival retraction for ultrapak cord was 0.85 mm and 0.45, for merocel strip, 1.12 mm and 0.69, and for magic foam cord, the values were 0.36 mm and 0.13, respectively. These values vary from a minimum of 0.40 to maximum of 1.93 for ultrapak, minimum of 0.37 to a maximum of 2.29 for the merocel strip, and for magic foam cord, minimum and maximum values were 0.27–0.70, respectively. The multiple comparisons were made by using Bonferroni's test. The test results revealed that there was a significant difference between the ultrapak cord and merocel strip and also between merocel strip and magic foam cord with respect to the mean vertical gingival retraction (P = 0.001); a significant difference was also found when ultrapak cord and magic foam cord were compared (P = 0.001). Similarly, when lateral gingival retraction was compared between three systems, ultrapak cord and magic foam cord showed statistically significant difference (P = 0.001) and also merocel strip and magic foam cord showed statistically significant difference (P< 0.001). However, no significant difference was found when merocel strip and ultrapak cord were compared (P > 0.05). Based on observation, magic foam cord induced no bleeding on removal. 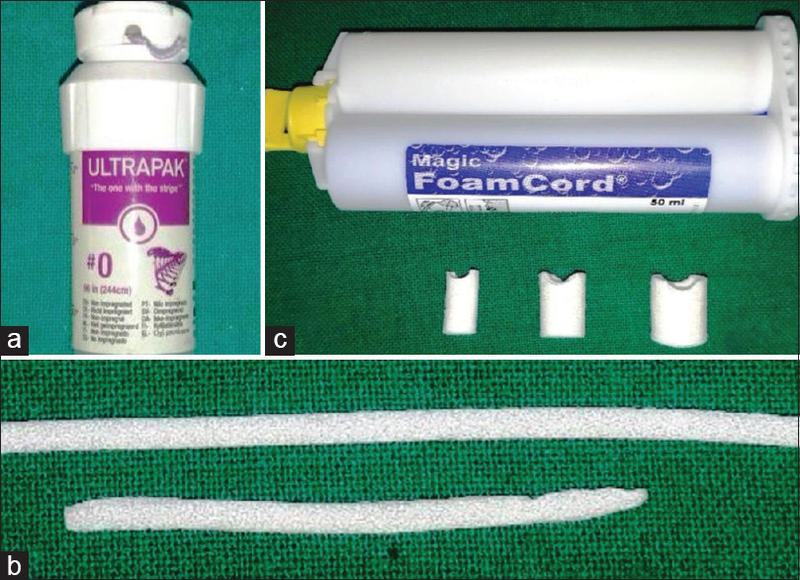 Ultrapak cord showed maximum bleeding on removal, followed by minimal bleeding on removal by merocel strip. The mean time taken recorded for placement in the gingival sulcus for ultrapak cord was 160 s, the merocel strip was 100 s, and magic foam cord was 80 s.
A study conducted by Gupta et al. demonstrated that magic foam cord was easier to place and less time-consuming and observed minimal bleeding on removal by the same system. The amount of displacement produced by ultrapak cord can be attributed to the following factors: impregnated retraction cord is a “chemicomechanical method” of gingival displacement. By combining chemical action with pressure packing, enlargement of the gingival sulcus, as well as control of fluids seeping from the walls of the gingival sulcus, is more readily accomplished. Phatale et al. reported that retraction cord achieves the desired retraction, but placing a retraction cord is not an easy method. It needs physical manipulation of the tissue, leading to gingival bleeding. Thus, use of a retraction cord has the risk of epithelial attachment injury, pain during cord placement, sometimes requiring local anesthesia, and also, more time is required. The main advantage of using cord is more economic and it is readily available. Different sizes are available to obtain varying degrees of retraction. The amount of lateral and vertical gingival retraction obtained by magic foam cord was comparable to retraction obtained with ultrapak cord and it induced no bleeding on removal. Phatale et al. investigated that from periodontal health point of view, retraction pastes were found to be better compared to cords when assessed histologically as the material respects the periodontium. The suggested null hypothesis was rejected as the statistical analysis revealed a significant difference of gingival retraction capacity between the materials tested. Within the limitations of the present study, merocel strip retraction system appears to be a promising system for the control of hemorrhage, minimal clinical time for application, and ease of placement when compared to the ultrapak cord. The amount of vertical and lateral retraction observed with merocel strip retraction system was significantly more than the ultrapak cord and magic foam. Merocel material is one of the most common nonabsorbable nasal packing materials described in the otolaryngology literature. It is a compressed, dehydrated sponge composed of hydroxylated polyvinyl acetate polymer that can increase in size by absorbing the fluid. By absorbing intracrevicular fluid, the porous and sponge-like microstructure of merocel strips ensures dry environment that allows adequate flow of impression material to record precise tissue details. In 1996, Ferrari et al. proposed this material as a predictable atraumatic gingival retractile material. In the same study, scanning electron microscopy evaluation disclosed that merocel strip did not contain fibers, thus eliminating the possibility of contaminating the wound with fibers and postsurgical complications. Later in 2013, Shivashakthy et al. compared the efficacy of merocel strip with double-cord retraction technique in providing vertical tissue retraction and found that gingival displacement produced by material strip was significantly more. Using a sensible solicitation of the technique to the clinical demand, it is promptly achievable with currently existing materials to uncover the gingival finish lines of prepared tooth dependable and record the margins in an impression without triggering iatrogenic tissue injury. Future study can be conducted to analyze the effect of the merocel strip on the health of the gingival sulcus epithelium and comparison of the same with other contemporary materials. 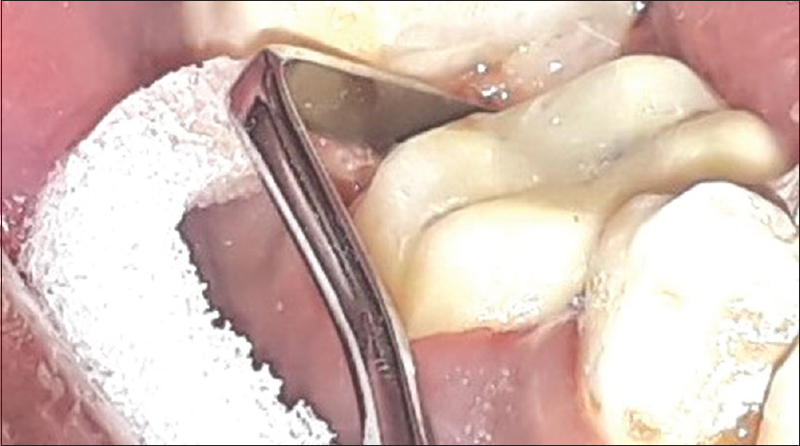 During the application of retraction system, it was observed that magic form paste showed no hemorrhage, hemorrhage was minimal with merocel strip, and moderate bleeding was found with the ultrapak cord. Ferrari M, Cagidiaco MC, Ercoli C. Tissue management with a new gingival retraction material: A preliminary clinical report. J Prosthet Dent 1996;75:242-7. Christensen GJ. Now is the time to change to custom impression trays. J Am Dent Assoc 1994;125:619-20. Wu AY, Donovan TE. 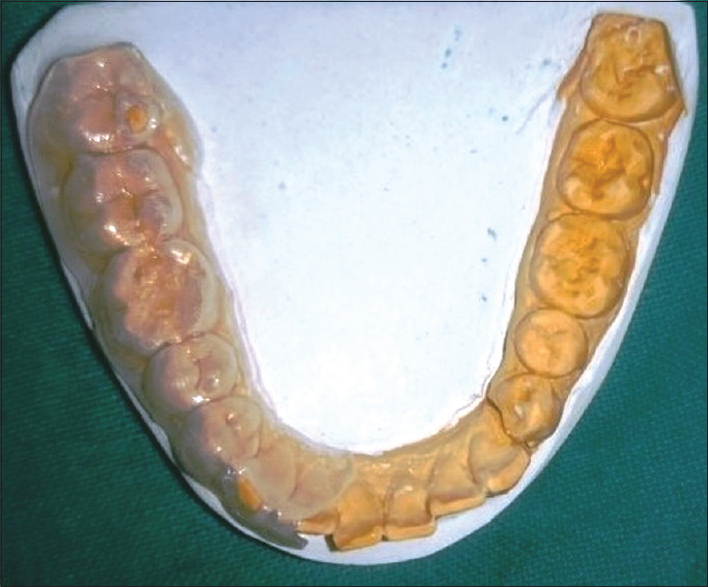 The use of vacuum-formed resin sheets as spacers for putty-wash impressions. J Prosthet Dent 2007;97:54-5. Löe H. The gingival index, the plaque index and the retention index systems. Journal of Periodontology 1967;38:610-16. Seibert JL, Lindhe J. Esthetics and periodontal therapy. In: Lindhe J, editor. Textbook of Clinical Periodontology. 2nd ed. Copenhagen, Denmark: Munksgaard; 1989. p. 477-514. O'Mahony A, Spencer P, Williams K, Corcoran J. Effect of 3 medicaments on the dimensional accuracy and surface detail reproduction of polyvinyl siloxane impressions. Quintessence Int 2000;31:201-6. Shivasakthy M, Asharaf Ali S. Comparative study on the efficacy of gingival retraction using polyvinyl acetate strips and conventional retraction cord - an in vivo study. J Clin Diagn Res 2013;7:2368-71. Stambaugh RV, Myers G, Ebling W, Beckman B, Stambaugh K. Endoscopic visualization of the submarginal gingiva dental sulcus and tooth root surfaces. J Periodontol 2002;73:374-82. Lynch JE, Hinders MK, McCombs GB. Clinical comparison of an ultrasonographic periodontal probe to manual and controlled force probing. J Int Meas Confed 2006;39:429-39. Ramachandra SS, Mehta DS, Sandesh N, Baliga V, Amarnath J. Periodontal probing systems: A review of available equipment. Compend Contin Educ Dent 2011;32:71-7. Holtfreter B, Alte D, Schwahn C, Desvarieux M, Kocher T. Effects of different manual periodontal probes on periodontal measurements. J Clin Periodontol 2012;39:1032-41. Sharma S, Thakur SL, Joshi SK, Kulkarni SS. Measurement of gingival thickness using digital vernier caliper and ultrasonographic method: A comparative study. J Investig Clin Dent 2014;5:138-43. Shillingburg T, Hobo S, Whitsett LD, Jacobi R, Brackett SE. Fundamentals of Fixed Prosthodontics. 3rd ed. Chicago: Quintessence Publishing Co. Inc.; 1997. Yilmaz MS, Guven M, Elicora SS, Kaymaz R. An evaluation of biodegradable synthetic polyurethane foam in patients following septoplasty: A prospective randomized trial. Otolaryngol Head Neck Surg 2013;148:140-4.